Das KOREA FORUM SPEZIAL erscheint seit 2013 zur Vertiefung von bestimmten Themen und zur Dokumentation relevanter Seminare und Tagungen. Mit dem KOREA FORUM SPEZIAL nr.2 widmet sich der Korea Verband dem Austauschprogramm EPRIE 2014. EPRIE ist ein jährlich stattfindendes Austauschprogramm mit 20 Teilnehmern aus Ostasien (China, Japan und Korea) und Europa (Deutschland, Frankreich und Polen). Es findet im jährlichen Turnus in einer der beiden Regionen statt. 2014 widmete sich das Programm den Konzepten von Nationen, weshalb das KOREA FORUM SPEZIAL Nr.2 auch diesen Titel trägt. Das englischsprachige Magazin umfasst Beiträge zu den Konzepten von Nationen und zur Versöhnung zwischen Ländern. In einem Sonderbeitrag berichten Mediatoren von inmedio von ihrer Arbeit und umschreiben ihren Beitrag zur Beilegung von Konflikten. Auch mehrere Alumni des EPRIE Austauschprogramms haben zu dieser Ausgabe beigetragen. In Essays und wissenschaftlichen Beiträgen beschäftigen sie sich mit dem Inhalt des Programms oder behandeln zwischenstaatliche Konflikte in Europa und Ostasien. Das Memorandum der Teilnehmer wurde ebenso in jeder Sprache der Länder der jeweiligen Länder abgedruckt. 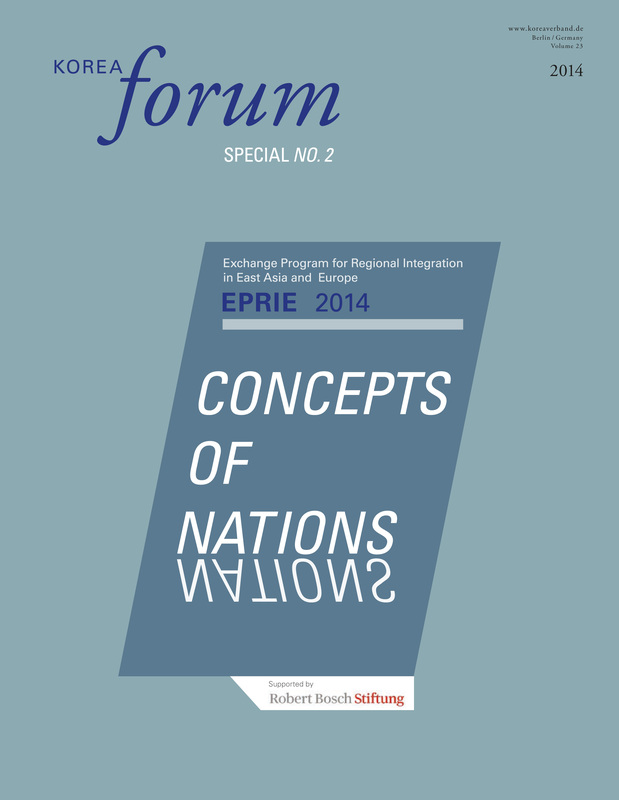 … was the title of this year’s Exchange Program for Regional Integration in East Asia and Europe (EPRIE). It comprised a twelve-day program during which young people from these two regions came together to discuss historical issues and topics that strain mutual relations and weigh on people’s minds to this day. East Asian states‘ nationalistic tendencies in politics have increased considerably in the past few years. Cooperation in foreign policy is crucial to address the remaining problems between China, Japan and Korea. Yet how is it possible for these countries to build new bridges in the face of constant debates about islands and attitudes toward the past? In Europe, voices critical of the European Union have grown dramatically, as became apparent in the recent election sof the European Parliament. Not only questions about the extent of regional integration versus member states‘ sovereignty, but also EU border security and immigration policy represent enormous challenges that need to be solved. To better understand the meaning of national interest and attitudes, it is important to examine the development of nation states. The seminar was therefore intended to illustrate the ’nation‘ as a political concept established in the 19th century. By bringing together researchers investigating the construction of nations in both regions, we discussed the images and metaphors that are implemented to maintain political power This volume presents a selection of contributions by speakers and participants who reflect on these topics. Dr. Elisabeth Botsch (European Academy Berlin) and Prof. Lee Chulwoo (Yonsei University) address differences in state formation. While Dr. Botsch illuminates the different developments of France and Germany, Professor Lee examines the multiple dimensions of nationhood and the dichotomy between civic and ethnic notions of a nation. Kim Hyun (Ph.D.-student at Tohoku University in Japan and Yonsei University in South Korea) asks why Japan and Korea have been unable to reconcile to this day and seeks an explanation for the growing animosity using the example of the ‚comfort women‘. Dirk Splinter and Ljubjana Wüstehube (inmedio Berlin) introduce the approach „from shared truths to joint responsibility (sha:re)“. They show that participants in this dialogue project can gain new understanding of one another, which often leads to a greater willingness to work together towards a better future. Since 2012, EPRIE offers twenty selected young people from Europe (Germany, France, Poland) and East Asia (China, Japan and Korea) the opportunity for direct dialogue and exchange during a ten- to twelve-day seminar on current problems resulting from the past. The participants of EPRIE 2014 summarized their thoughts in a memorandum which they then translated into their own languages. 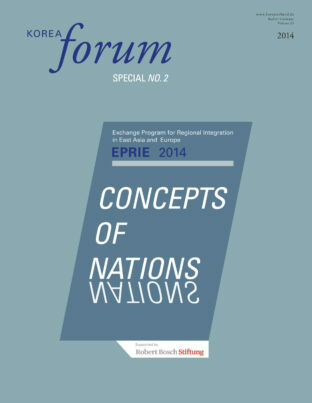 The Korea Forum Special EPRIE presents a platform for continuing the discourse on various related topics which extend beyond the boundaries of the seminar. It offers EPRIE alumni the chance to continue the dialogue they have begun. We are especially pleased that former participants use this opportunity and take part in the publication with own contributions. IN his theoretical work, Katsumata Yu observes the role of capitalism in nation-building. Franziska Fröhlich examines the Korean minority in China and their influence on Chinese-Korean political relations. Isabella Jukas considers whether the process of reconciliation between Germany and France can be transferred to the case of Japan and Korea. Finally, Aleksandra Jaworowicz-Zimny explores the role of pop culture in shaping a country’s image and in fostering international dialogue- especially between neighboring countries that share a difficult past.